Bitdefender Total Security 2016 provides all-round protection to your PC against the nasties of the internet. The suite includes everything from virus shield to firewall, banking protection and PC-tune up, to parental controls and high-level encryption. Bitdefender Total Security 2016 is a high-quality security suite that not only protects your PC from viruses, but also offer many security and privacy related features such as comprehensive built-in firewall, bitdefender safebox that can backup your important data to its secure servers. Bitdefender Total Security 2016 privacy control setting offers anti-phishing capabilities, file encryption,file shredder, data protection and chat encryption. Furthermore Bitdefender wallet protects your online credentials and manages your passwords. Bitdefender parental control function allows you to control internet access and usage of specific applications. Also , this service will let you know what kind of pages your kids are visiting. For e-shopping and secure online transactions, you can utilize Bitdender safepay module, safepay is a customized browser that offers sealed environment for online banking and shopping. Bitdefender Total Security 2016 offers higher level of PC optimization with Bitdefender photon technology, photon improves the speed of the security engine so there will be less system resource consumption and slow downs. To accelerate and fine-tune your PC, total security offers One Click Optimiser module.This module will tune your PC with registry, disk and privacy cleaner. The Startup Optimizer will improve the boot time of the PC by optimizing startup programs. 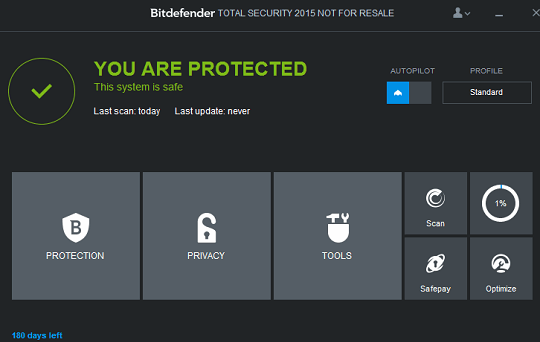 Bitdefender Total Security 2016 introduces few new features such as Bitdefender Profiles, Quick vulnerability scanner, and MyBitdefender cloud access.